You've taken the time to develop your musical skills, your repertoire, your stage presence, and your own unique sound. But you can't put any of that on a business card. This is why the card's design is worth some consideration. You want something to hand to people, whether they're agents, managers, other musicians, or the general public, that's essentially a visual representation of your act. 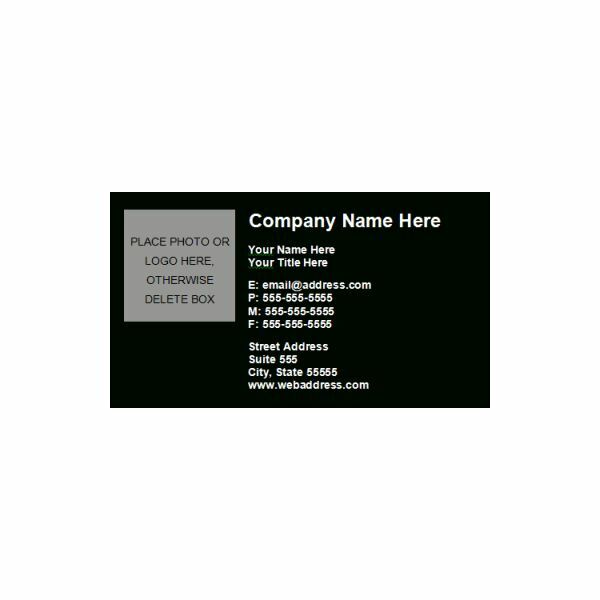 If your band has a logo, you'll be interested in some of the templates that allow for image file insertion. If not, you'll find some designs that are appropriate to your genre and musical brand. 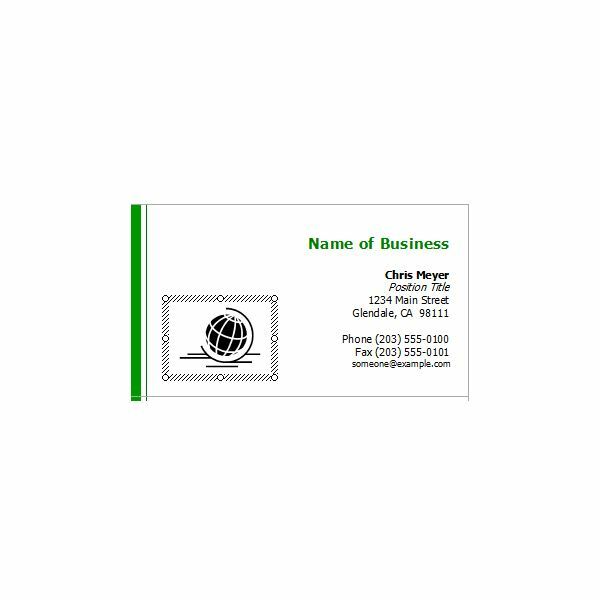 Every one of these music business card templates is available via the specific links provided below in the references section of this article. You can get a good look at them here, along with some suggestions on how to use them, or adapt them easily to your needs. These two cards make use of the same basic symbols: a bass clef and two eighth notes in the staff. Using this design, your status as a music professional is instantly communicated. 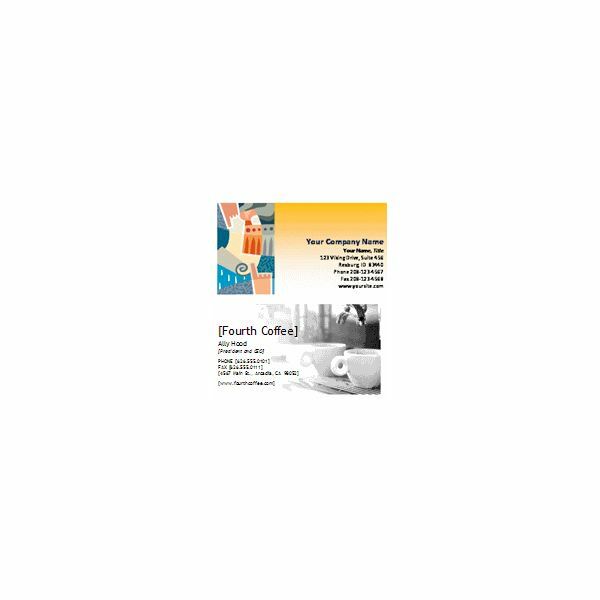 Provided for Microsoft's Office website by Avery, these two are available for Word 2003 and later, and are designed for use with Avery cardstock 5371, 8371 and 8871. "Company Name" should be your band name. Any "job title" section should include the instrument(s) you play. Physical address sections can be better served with website addresses: your band's home website, Facebook, and Twitter pages. 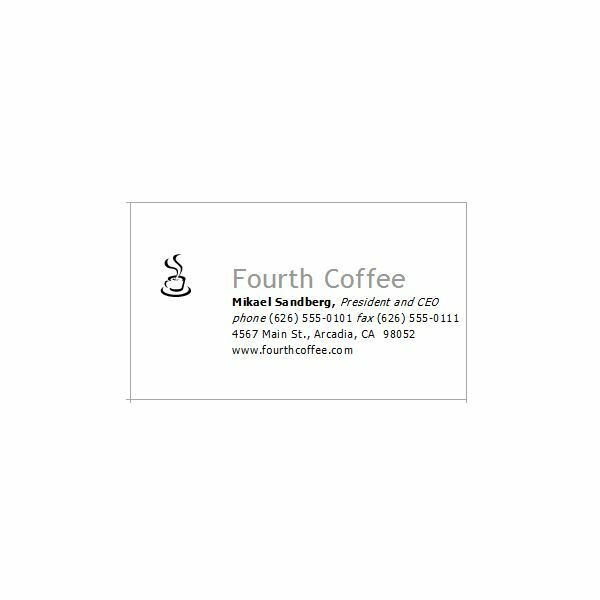 If you and your group play jazz, or a similarly esoteric blend outside the mainstream, here are a couple of top business card designs you may find appealing. Though they weren't specifically intended for musicians, the abstract art on one and the coffee cups on the other could be associated with an eclectic vibe — especially if you frequently play the coffeehouse and bookstore/cafe venues. With the exception of what appears to be an amphitheatre, the content of the Abstract Paperwork card doesn't particularly present a musical or performance theme, but the inclusion of abstract art (or a mimicry of it) goes well with 'intellectual' music. Complex harmonies, rhythms, solos, and song structures tend to require a refined taste to be appreciated, and abstract art is an understood visual complement. Both of these templates work with Avery 5371, 8371, and 8871, and are available as dotx files, which will work on Word 2007 or later. The compatibility pack for earlier versions of Word does not support dotx files. Open Office 3 cannot properly display them, either. 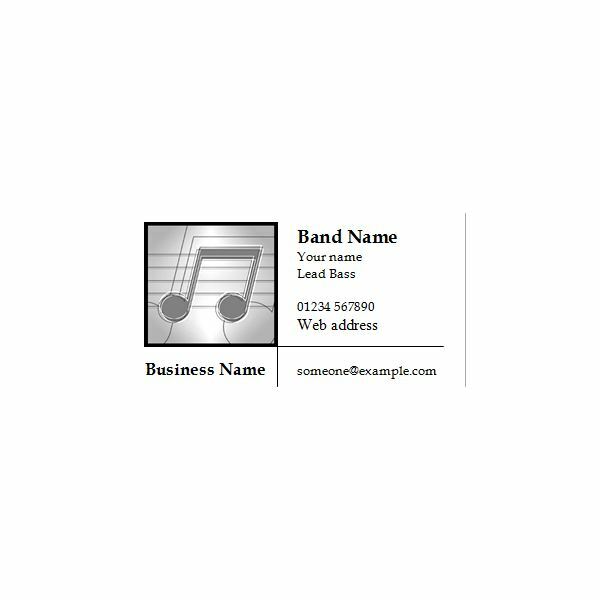 These next two cards, available for use in Word 2003 or later, provide a space for inserting your band's logo, or any other image you may wish to include. The one on the left, has the advantage of logo inclusion while saving ink on the rest of the card. The next one (general format), has a cleaner layout, and more space to feature your image. The green border and text add a subtle effect, but if green is not your color, there are still more templates to choose from. I find this next one to be quite effective in terms of its use of space, although I modified the default color for this screenshot. The color is inserted into the Word document (again, 2003 or later) as a picture, so if you don't particularly like the greenish-yellow of the Modern Elegance design, you can adjust the brightness through many shades of yellow to off-white, green to dark green and dark blue, many levels of grayscale, and black. The darker shades provide a nice contrast to the white lettering. It's a simple and subtle design perfect for a creative and sophisticated jazz band. These two noteworthy templates are essentially the same; obviously one has colors and the other does not. 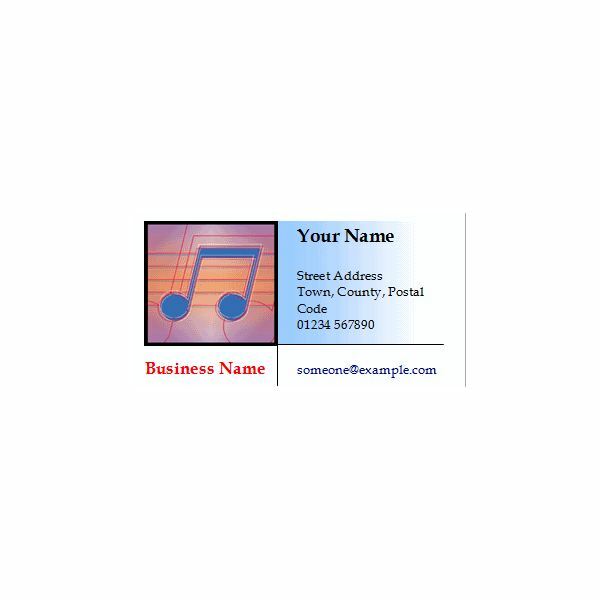 It's good to have options, especially when free business card templates with a musical theme are difficult to find. With the final template in this list, I want to show how even a generic template can be "jazzed up" with musical dingbat fonts. 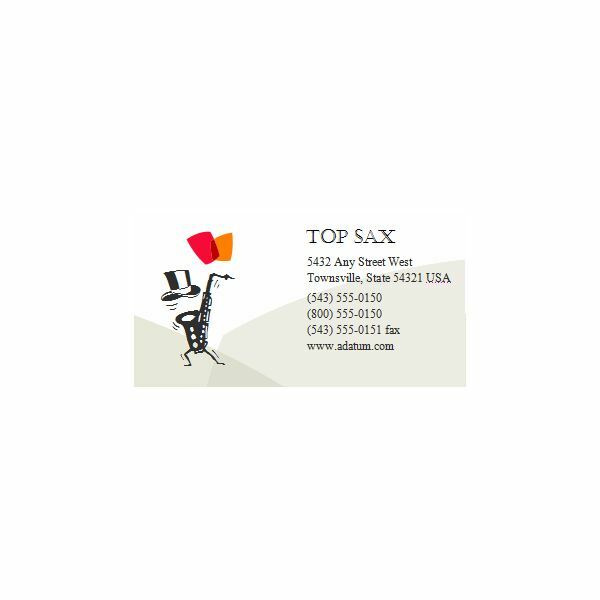 The saxophone with a top hat is actually a dingbat enlarged to fill a modified text field. The font type is called 'wmmusic' and can be found on dafont.com. Dingbats are easy to use if you haven't done so before. This particular template I found quite simple to manipulate in Word 2003 – just ungroup the text fields and you can select the one on the left to expand the size. 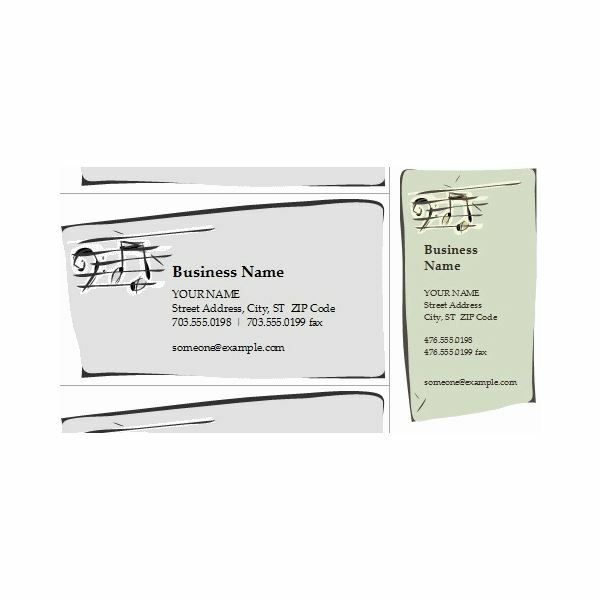 With some creative thinking, you can make any jazz band business card template your own! Some additional thoughts on getting the right look for your band's sound: What words would you use to describe your band's impact on an audience? Are you intense and energetic or more cool and low-key? Do you play strictly covers, originals, or a combination? What other bands might you be compared to? When in doubt, just follow your intuition, and remember that the information on the cards is, ultimately, more important than the card's appearance. Image credits: All screenshots taken by author.